Big and unique, staghorn ferns are a surefire conversation starter. By nature, staghorn ferns are epiphytic plants that grow by attaching themselves to tree trunks or limbs. 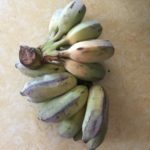 They aren’t parasitic because they draw no nutrition from the tree. Instead, they feed on decomposing plant matter, including leaves. So can staghorn ferns be potted? 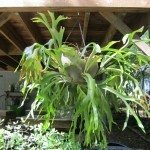 Read on to learn more about potting a staghorn fern. 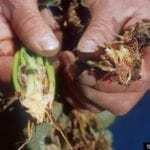 Can Staghorn Ferns Be Potted? This is a good question since staghorns generally don’t naturally grow in soil. The key to growing staghorn ferns in baskets or pots is to replicate their natural environment as closely as possible. But, yes, they can grow in pots. 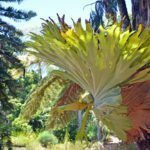 If you’re interested in potting a staghorn fern, there are a few things you should keep in mind. Wire or mesh baskets are well-suited for growing staghorn ferns, but you actually can grow one in a standard pot. Fill the pot with a loose, well-drained potting mixture: preferably something like shredded pine bark, sphagnum moss or similar. Be sure to repot when the plant gets crowded. Also, remember that it’s easier to overwater in a regular pot because drainage is limited. Water carefully to prevent the plant from becoming waterlogged. To grow staghorn ferns in baskets, begin by lining the basket with at least an inch (2.5 cm.) of moistened sphagnum moss, then fill the basket with a very well drained potting mix, such as one containing a mixture of equal parts bark chips, sphagnum moss and regular potting mix. Staghorn ferns in baskets do best in large baskets measuring at least 14 inches (36 cm. ), but 18 inches (46 cm.) or more is even better. Staghorn ferns prefer partial shade or indirect light. Avoid direct sunlight, which is too intense. On the other hand, staghorn ferns in too much shade tend to grow slowly and are more likely to develop problems with pests or disease. Feed staghorn ferns every month during spring and summer, then cut back to every other month when growth slows in fall and winter. Look for a balanced fertilizer with an NPK ratio such as 10-10-10 or 20-20-20. Don’t water your staghorn fern until the fronds look slightly wilted and the potting medium feels dry to the touch. Otherwise, it’s easy to overwater, which can be deadly. Once a week is usually enough during warm weather, and much less when the weather is cool or damp.